The last time I visited Takamatsu was in 2009, one year before the first annual Setouchi Triennale. It took me 4 years to return to Takamatsu and nothing has really changed. I had a chance to see a bit more of the city-centre but due to my priorities of visiting the various islands in the Seto Inland Sea, I didn’t get much of a chance to see the other areas of Takamatsu. For this trip, I skipped over the main attraction, Ritsurin-koen, and only had Sanuki Udon once. Even though I had a long stay in Takamatsu, when you spend your days on the islands, it is difficult to see the city as you only have evenings when most of the tourist attractions are generally closed or closing. While I couldn’t visit all of the tourist attractions this time, there is still plenty to see and do at night when the city changes. The last time I visited Takamatsu, I rode my motorcycle into and out of the city. I used the train to get to Kotohira so I could climb Konpira-san and I used the train to go to Ritsurin-koen. This time, I flew in from Haneda and left by train via the Great Seto Bridge. I can honestly say that I have used every reasonable method of getting into and out of Takamatsu. For those without a car, or those who don’t live close to Takamatsu, the best way in is via public transportation. 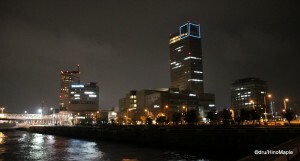 From Tokyo, the best way in is via Haneda Airport. Both ANA and JAL have regular flights and they aren’t too full either. I took an afternoon flight which meant I arrived in Takamatsu around 4pm. The flight used an old 767 and it was so empty that almost everyone had a window seat. 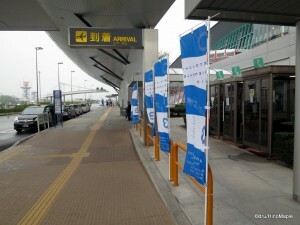 It is just an hour flight but since I was paranoid, I got to the airport about 2 hours early. In reality, you only need about 1 hour if you have no checked bags, but sometimes you can’t be too careful. The only downside to flying into Takamatsu is that the buses for the city are timed to each flight so you only have a few minutes to use the airport and board the bus, otherwise you’d have a lot of free time to check it out. For the train, I was annoyed that Jorudan/Hyperdia often quoted me the Green Car fee to get around rather than the regular fare. In other areas of Japan, when a train has a special name, it often requires an extra surcharge. In Shikoku, this is not always the case. A regular fare ticket is sufficient and what I thought would be a 2,400ish yen fare was actually about 1,400 yen. Otherwise, the trains were a very easy way to get in and out of the city. When it comes to driving, the regular roads are nice but the highways are king when it comes to saving time. The only bad part about all of this is that you often have trouble getting onto and off the highways as there aren’t enough on-ramps and off-ramps in Shikoku. Staying near Takamatsu station meant that I couldn’t really get out too easily. The station isn’t the central area of Takamatsu. It is next to the harbour and the central shopping and nightlife area is about a 10 minute walk from the station. Most of the city’s transportation is centred on the trams and most of the night life is centred on an area a little south of Takamatsu Station. The main shotengai (shopping street) is very long with lots of interesting places to stop along the way. I did a lot of walking in Takamatsu after my first full day at the Setouchi Triennale. I walked over 5 km in Takamatsu after walking under 7 km on Inujima and Teshima. Needless to say I took a rest after a while of walking and I somehow still had enough energy after this first day to enjoy the rest of my time in Kagawa. 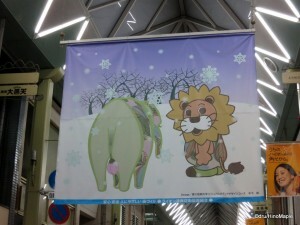 One of the more “interesting” things I had a chance to see, but not do, was walk along the shotengai “Lion Street”. I didn’t know what it was at first but as I was walking along the street, I realized it was a shotengai that was next to the hostess club area. In many small cities in Japan, the shotengai are often places to find various shops as well as restaurants, and a few blocks away, you have the “entertainment” district. Usually the shotengai near the hostess club area is at the end of the main shotengai or hidden enough that as a tourist you generally don’t notice it. 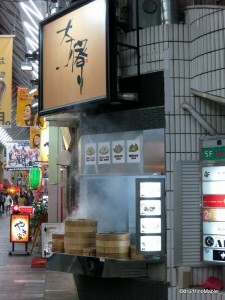 The good thing about these shotengai is that they often have lots of restaurants in the area. I was starving at that time, and I was lucky to have stumbled upon this area. Honestly, I was trying to find this area because it is fairly common to see nikkuman (Chinese pork buns) shops and ramen shops near these areas and in the shotengai near these areas. You can see similar shops near Kabukicho in Tokyo but they are more prevalent in smaller cities. As I was eating my nikkuman, my theory seemed to have been confirmed as I saw some young girls dressed in skimpy dresses talk to a few guys and pull them towards their shop. I also saw a bunch of other young hostesses walking around that same area and some of them were even a bit brazen enough to go into the main shotengai which was only 1-2 blocks away. It was interesting to see such a vast difference between the two shotengai as the main shotengai was pretty G rated. The fact they were only a couple blocks away from each other made it even more amazing but that is typical of Japan. You never know what is just around the corner. Takamatsu is a great city and even better now that I have visited it for a second time. I didn’t think as highly of it the first time I was there, and I would hope that there is still a bit more for me to see in the city. While I am not holding my breath to expect there to be a lot more, I am certain I can be surprised by it if I return. There is a high chance I will be back again for the 2016 Triennale and I’d more than likely do the exact same thing as I did this time. I might explore a different area of the city but it is unlikely that I would wander much farther than what I did. I do wish I had a bit more time to explore the castle park area that I skipped once again, but more due to the lack of energy and time than anything else. I would even reconsider revisiting Ritsurin Koen in the future but unless it is the right season, I doubt it. I find gardens and parks to be uninteresting in the winter and early spring as the plants are still in “hibernation”. If you do go to Takamatsu, you can easily spend a couple days to see everything, but it would take a bit more time to truly enjoy it. I already miss the laid back atmosphere of the town and can’t wait for 2016 to come around. Takamatsu Revisited is a tangential part of a series of posts on the Setouchi Triennale. Follow the links below to read more about the different aspects of the Setouchi Triennale. This entry was posted in Shikoku and tagged Airport, japan, Kagawa, Kagawa-ken, Konpirasan, Kotohira, Lion Street, Lion-dori, nikkuman, Plane, Ritsurin, Ritsurin Koen, Ritsurin Park, Sanuki, Seto Inland Sea, Setouchi Triennale, shotengai, Takamatsu, train by Dru. Bookmark the permalink. The problem for Takamatsu in terms of tourism is that none of the tourist attractions are downtown (with the exception of Tamamo castle and the museums). So tourists don’t know they exist most of the time (and travel book guides don’t do any better as they only cover what is already famous, they never make you discover new things anyway). There are plenty of fascinating places in and around Takamatsu (especially if you like traditional culture), but they are far from downtown. As far as Shotengai go, I have read many times (can’t confirm though) that Takamatsu has the longest shotengai network of Japan. The thing with them today, just like in most of Japan is that they’re getting abandoned for US style shopping malls (that I personally despise). So while it used to be the heart of Takamatsu 50 years or so ago, Lion dori is not pretty derelict (during the day, most shops are closed or very old little shops who have had the same few customers for many decades) but at night, the mizu-shobai industry has taken it over. Marugamemachi has been luckier, with the implantation of Mitsukoshi nearby that attracted other fancy stores (Louis Vuitton and alike) and in recent years the whole street has been renovated and gentrified for better and worse (better because it’s working and it’s bringing people back downtown, worse because it’s a bit too gentrified for my taste and small privately owned shops are still disappearing being replaced by chain stores). I think the fact that a lot of places are outside of the downtown area is true of a lot of rural Japan. Well, rural is the wrong word for Takamatsu. I should say small cities of Japan. 🙂 I’m sure there are a lot more things to see but I can’t help but feel it is just difficult if you don’t have a car. If I had a bit more time, maybe I’d venture out to the other areas too. I hear you on the gentrification. It isn’t good but better than having them go completely away. I think there can be a good mix. Some creative brands can get started, but it is hard to keep them in such a small city. Wish I had a better idea on what to do for those shotengai. A bunch of places are accessible by train (Yashima, Busshozan) but you need a car (or good feet) to get to a few great temples in the middle of nowhere indeed. I think the renovation of Marugamemachi is really a success, and gentrification was the only way really. And it’s not that bad, as soon as you start walking away from Mitsukoshi, you’ll find a bunch of different stores, some of them having been there for a while and were probably saved from closing next to it. Main tram station? There’s no tram in Takamatsu. Do you mean the local train; the Kotoden? If you went to its main station (Kawaramachi), either you went through Marugamemachi Green (the interesting mall) or you didn’t go down Marugamemachi at all. I just checked, and sure enough, Marugamemachi Green was visited by me. I just walked right past it without much thought. I must have been too hungry at the time. 😀 I walked about 1 or 2 blocks farther. I thought it would have been bigger for some reason. Marugamemachi Green is pretty small, that’s what makes it bearable. We attempted to try to walk the whole shopping street one evening, but it was after we’d done the Shikoku Mura so we were pretty beat. We only managed towalk a bit before conceding defeat. – Hyogomachi and Kataharamachi : about 850 m.
– Lion-dori: about 500 m.
I vote for David as president! “Travel book guides don’t do any better as they only cover what is already famous, they never make you discover new things anyway.” YES! “US style shopping malls (that I personally despise) … ” Quadruple YES! Dru, I was beginning to think you’d gone missing in action. I thought maybe a rival business consortium had abducted you.